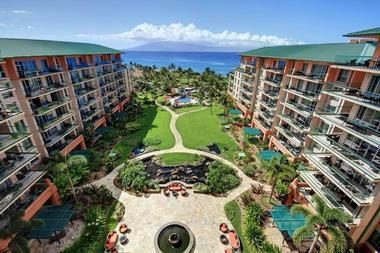 Located on Maui’s famous Kaanapali North Beach, Honua Kai Resort & Spa is a deluxe oceanfront condominium resort that offers luxury accommodations, modern amenities and an array of activities. 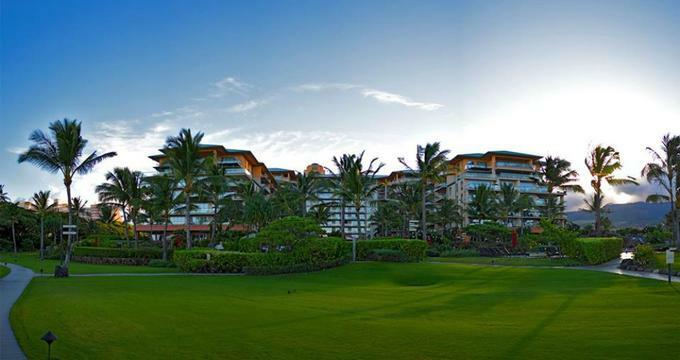 Set on 38 tropical acres of pristine beachfront property, Honua Kai Resort & Spa features over 600 spacious suites, two restaurants, an exclusive spa and wellness center, and a full service concierge desk. 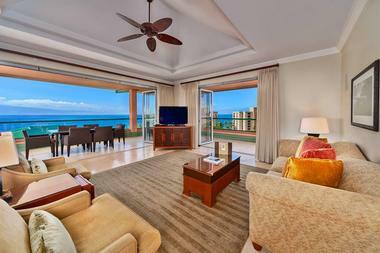 Suites are comfortably furnished with Island-style décor and furnishings, deluxe en-suite bathrooms with walk-in showers, fully equipped gourmet kitchen with appliances, modern amenities, and large lanais with spectacular views. The on-site spa offers pampering massages and body treatments, and the fully equipped fitness center is ideal for staying fit. Honua Kai Resort & Spa provides a variety of accommodation ranging from studio to one, two and three bedroom suites with island-style inspired décor and comfortable furnishings, king or queen sized beds with deluxe linens, en-suite bathrooms with walk-in showers and branded bath products, and fully equipped kitchens. Modern amenities include flat-screen televisions in every room, direct dial telephones, full-size refrigerators, microwaves and dishwashers, washers and dryers, irons and ironing boards, coffee makers, and safes. Studio Suites are ideal for small families, couples, and business travelers with 595 square foot open plan living areas with contemporary Hawaiian-style décor and furnishings, queen-size sofa beds for extra guests, bedrooms with king-size beds with pillow-top mattresses and deluxe linens, and en-suite bathrooms with walk-showers. Fully equipped gourmet kitchens have granite countertops, wood cabinetry and modern appliances and private balconies have beautiful views. One bedroom suites are 630-750 square feet in size and feature open plan living areas with contemporary Hawaiian-style décor and furnishings, queen-size sofa beds for extra guests, bedrooms with king-size beds with pillow-top mattresses and deluxe linens, and en-suite bathrooms with walk-showers. Fully equipped gourmet kitchens have granite countertops, wood cabinetry and modern appliances and private balconies have stunning views over the beach and ocean. Two bedroom suites have 1,100 square feet of space with two separate bedrooms with king-size beds with pillow-top mattresses and deluxe linens, and en-suite bathrooms with walk-showers. Open plan living areas have contemporary Hawaiian-style décor and furnishings, queen-size sofa beds for extra guests and fully equipped gourmet kitchens have granite countertops, wood cabinetry, and modern appliances. 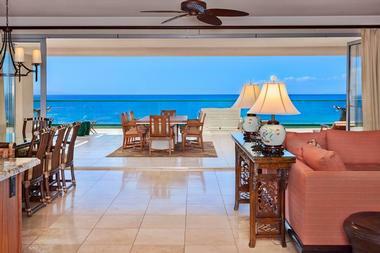 Private balconies have stunning views over the beach and ocean. Three bedroom suites boast 1,750 square feet of space with two separate bedrooms with king-size beds with pillow-top mattresses and deluxe linens, and en-suite bathrooms with walk-showers. Open plan living areas have contemporary Hawaiian-style décor and furnishings, queen-size sofa beds for extra guests and fully equipped gourmet kitchens have granite countertops, wood cabinetry, and modern appliances. Private balconies have stunning views over the beach and ocean. Honua Kai Resort & Spa offers an array of dining opportunities to satisfy every palate ranging from gourmet kitchens in every suite for self-catered cooking to a relaxed, beach café and a fine dining restaurant. Named after legendary Hawaiian surfer and waterman Duke Kahanamoku, Duke’s Beach House offers guests an authentic Hawaiian dining experience with a menu of creative cuisine created from fresh, locally sourced ingredients. Duke’s Beach House is open for breakfast, lunch, and dinner and serves an array of Hawaiian-influenced cuisine, including fresh seafood and premium steaks. ‘Aina Gourmet Market is a charming, rustic café that serves healthy grab 'n go meals and casual fare in the form of fresh salads, sandwiches, hot paninis, freshly baked pastries and coffee. The Market also sells a full range of groceries and sundries, including a full range of breakfast, lunch and dinner items that are available daily, including muffins, bagels, wraps, quiches, and more. Honua Kai Resort and Spa offers an array of first-class amenities and facilities, including two restaurants – a casual café and market and a fine dining restaurant, a 24-hour fitness center, a 24-hour concierge desk, a full service bar and lounge, barbecue grills, and beach and pool services. Additional services include laundry facilities, wireless Internet, porter and bellhop services, and valet parking. 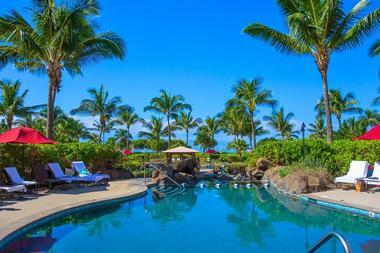 Maui is a perfect place to enjoy a variety of recreational and outdoor activities, which can be arranged at the hotel. Activities include hiking, mountain hiking, helicopter tours, zip-lining, rappelling, snorkeling, scuba diving, volcano tours, and surfing. 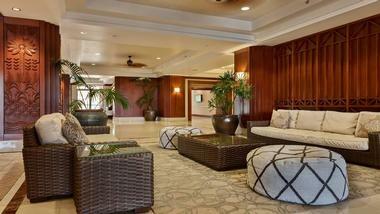 The exclusive Ho‘ola Spa offers a range of contemporary body treatments, massages, and skin care using Malie Organics. Utilizing wild crafted mauka (mountain) and makai (ocean side) ingredients, spa treatments provide a seamless balance of earth and sea that is unique to Maui and the Hawaiian islands.